This graphic illustrates the differences between both El Ninos. 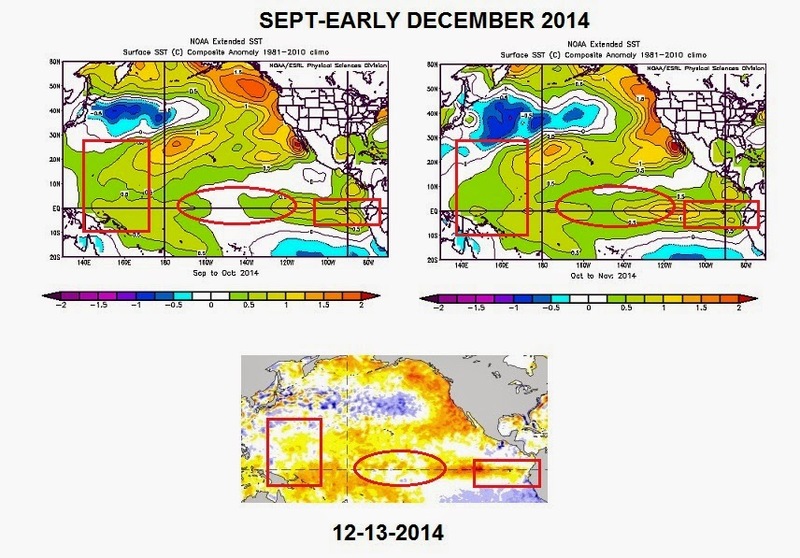 El Nino Modoki on top, Eastern El Nino (typical El Nino) on bottom. Notice the cooler water flanking the relative warmth in the middle of the Pacific near the dateline. 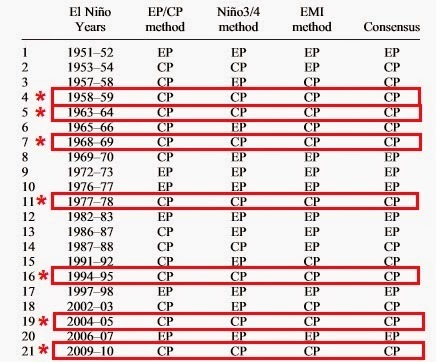 Dr. Yu's 2012 paper summarizes each of the 21 El Nino events since the early 1950s using three El Nino Indices. 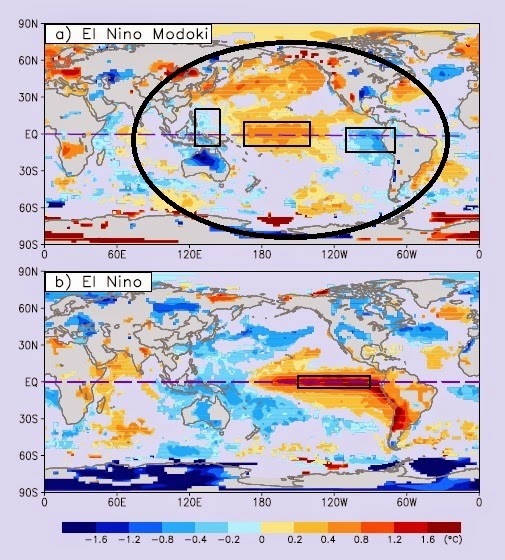 The El Nino Modoki Index (EMI Method), the basic Nino method using the Nino3/4 sea surface temperature readings and the EP-CP Index derived by Dr. Yu and his colleagues published in his 2012 paper. 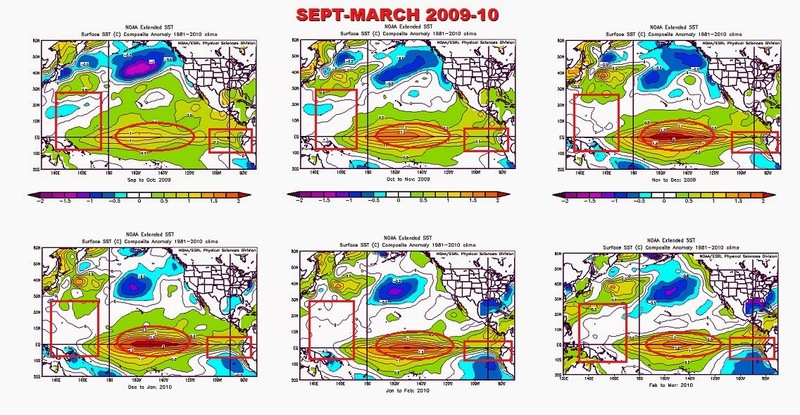 I highlighted the seven consensus Central Pacific El Nino events across all three indices. While the list above doesn't identify specific Modoki El Ninos among the Central Pacific El Ninos, checking the average sea surface temperatures starting in September and overlapping each month through February/March, "Modoki type" temperature signatures (cold pockets flanking warmth near dateline) can be seen. 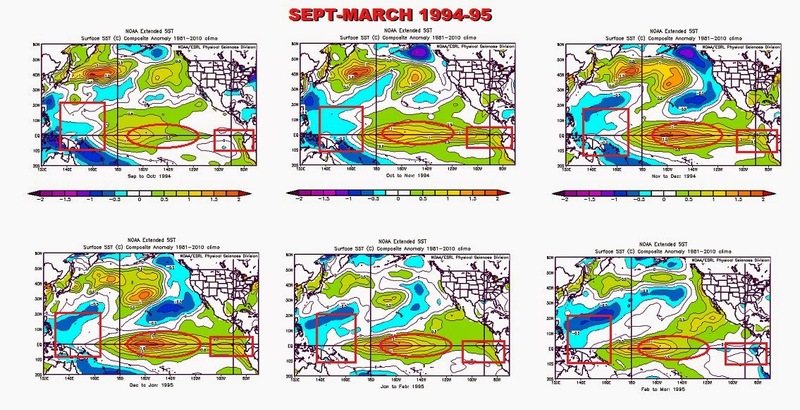 Below are the seven consensus Central Pacific El Ninos in chronological order. Each evolved differently. 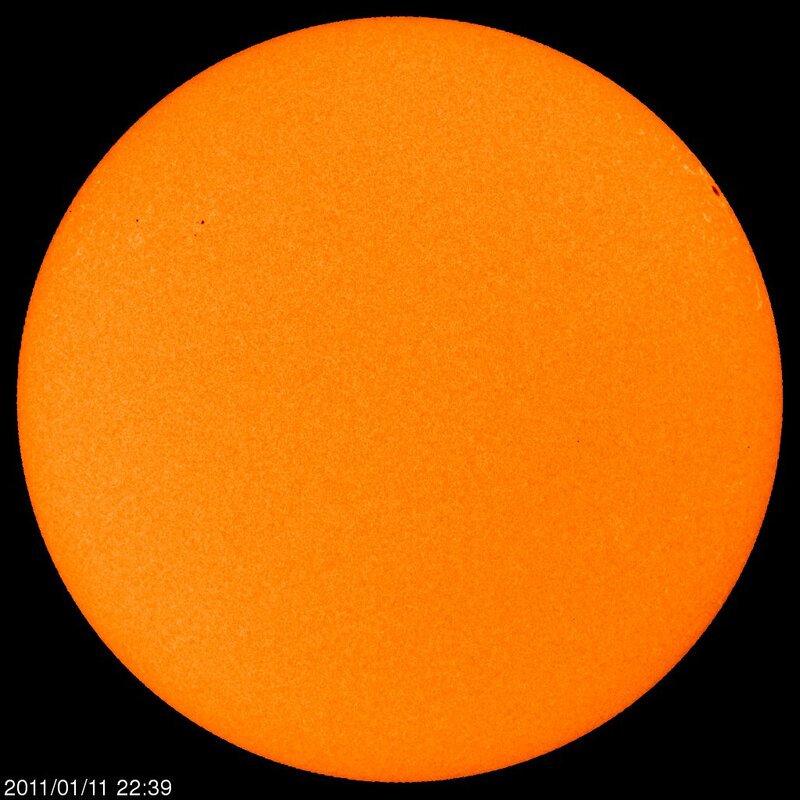 Each one has central warmth (2009-10 was the warmest). Only 1958-59, 1963-64 and 1977-78 seem to have the strongest "Modoki" signature (cool pockets east and west) by visual inspection. 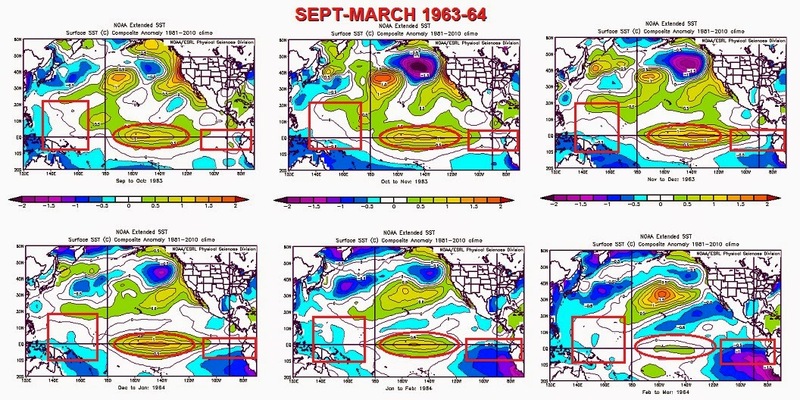 One other note, notice the warmth along the west coast of North America in 1958-59, 1963-64, 77-78 and partially in 2009-10. 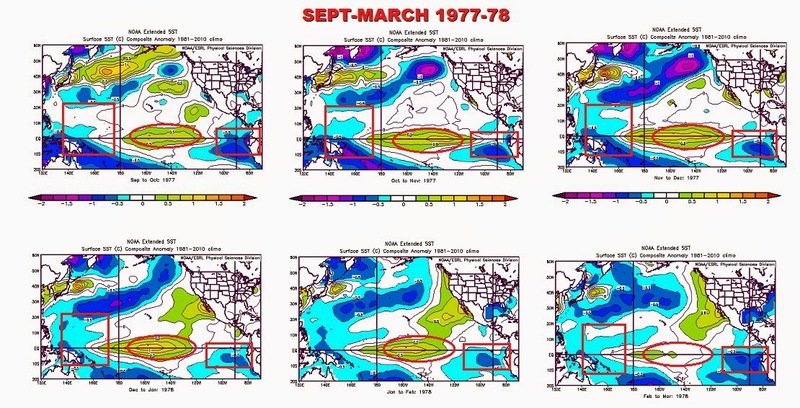 Professor Yu shows in this paper that this warmth is connected to the development of the Central Pacific El Nino. The coastal warmth is associated with the North Pacific Oscillation teleconnection. What can we say about these seven events? The central warmth seems to mature in January. The cool pools east and west were firmly established by October in the first four events (1950s through the late 1970s). What about our current event? The central warmth us weaker than 2009-10. The coastal warmth is off the charts due to the North Pacific Oscillation index rising to the highest levels ever for November going back 60 years! The cold pools east and west are showing some signs of developing. As of mid December, the Modoki signature comparing all three sea surface temperature regions to the other seven events is weak. 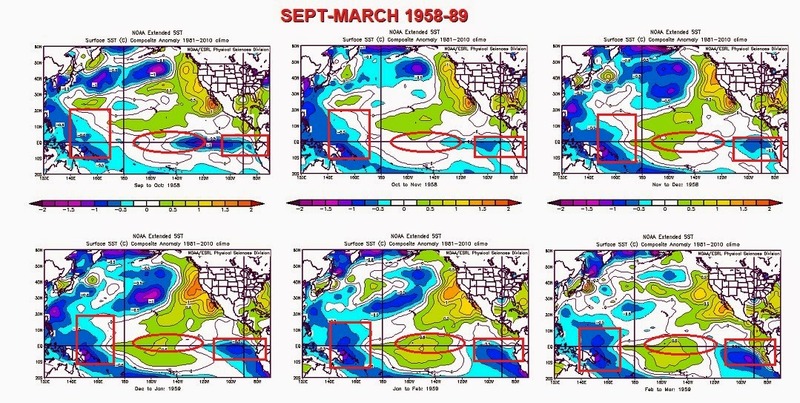 The next 6 weeks will be critical in determining whether this Central Pacific El Nino will continue to mature into a formidable driver of the early 2015 winter pattern. Based on past analogs, it should.